Faculty exhibitors with their work, March 1960. 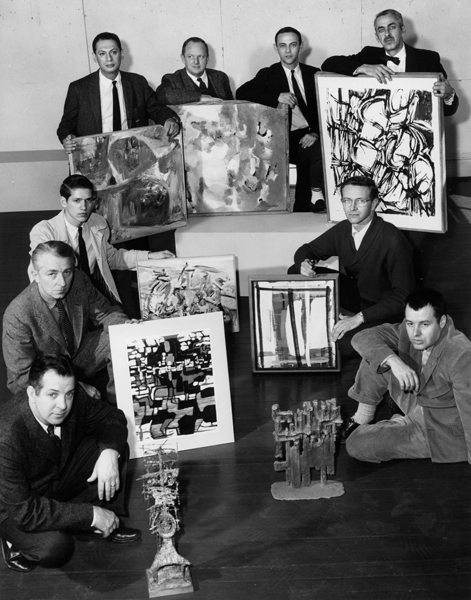 Publicity photo of faculty exhibitors, with their work, March 1960, standing/back row, l-r: Melville Price, Richard Brough, Joe Bolt, Howard Goodson. 3rd row, l-r: William Christenberry, Ted Klitzke. 2nd row, l-r: Richard Zoellner, Angelo “Jack” Granata. 1st row: Frank Engle. By unknown photographer, The University of Alabama, March 1960, black and white photograph, approx 8 x 10", written in pen on back: "March 1960", Department of Art Archives.